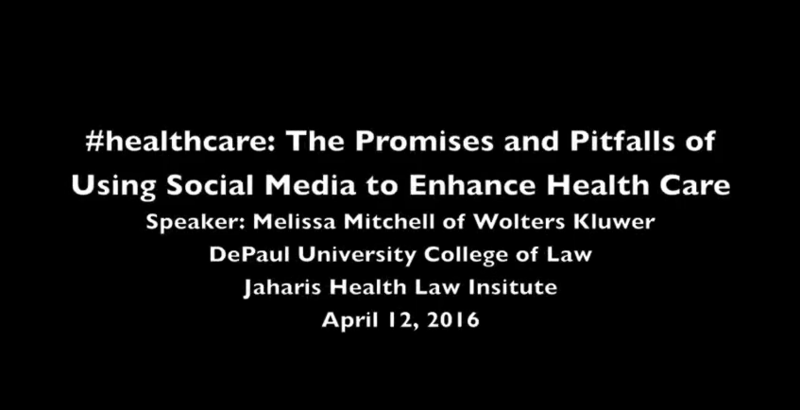 Writer/analyst Melissa Mitchell (JD ’09) with Wolters Kluwer’s health law editorial team presented “#healthcare: The Promise and Pitfalls of Using Social Media to Enhance Health Care” at DePaul's College of Law on April 12, 2016. Her lecture explored how social media functions from a health care consumer standpoint, and was the final in a series hosted by the Mary and Michael Jaharis Health Law Institute during academic year 2015-2016. Mitchell addressed how health care providers may take advantage of the opportunities presented by social media while avoiding the pitfalls of its use and overuse. The lecture delved into how social media can enhance knowledge and the spread of information on both the consumer and the provider sides. Mitchell discussed how the use of social media can make the delivery of health care more complicated and dangerous, as well as how providers can get into hot water when the use of social media in their organizations goes awry. For more information or to be added to the JHLI email list, please contact Kathryn Brown or Sarah Balas.